Our Interface-it software lets you adjust set-points and ramp rates, log dry-well readings to a file, create an electronic strip chart, and perform thermal switch testing with data collection. The software is written for Windows and has a great graphical interface. Regardless of whether you want basic software or a completely automated calibration system, we've got what you want. Read about all our great packages starting on page 80. Every dry-well we ship is tested at our factory, and every unit comes with a NIST-traceable calibration. There's no extra charge for the report, because we consider it an essential ingredient in our quality program. You shouldn't have to pay extra for calibration procedures we perform anyway. 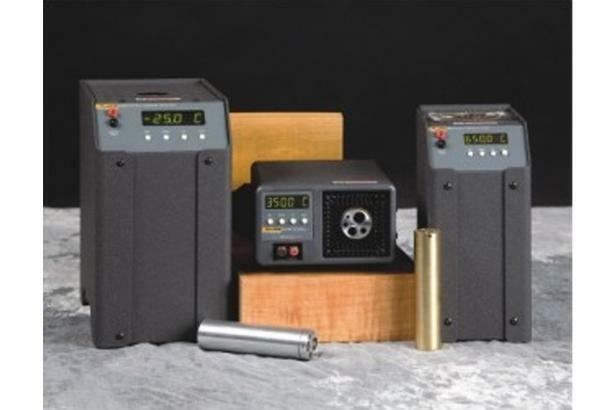 The 9140 has a temperature range of 35 °C to 350 °C, and it reaches its maximum temperature in 12 minutes. At six pounds, it's small enough to easily carry in one hand. It's truly a unique innovation in dry-wells. If you’ve been using dry-well calibrators for field work, you know there’s a lot more to a dry-well than its temperature range and stability. Size, weight, speed, convenience, and software are also significant. Field dry-wells need to be portable, flexible, and suitable for high-volume calibrations or certifications. If they’re not, you’ll soon forget about the great stuff the sales rep told you and realize what you’ve really bought. At Hart Scientific, we use dry-wells every day in our manufacturing and calibration work, and we know what makes a dry-well easy and productive to use—which is exactly how users describe our series of field dry-wells. These dry-wells work for you instead of the other way around.